Module blocks are OpenCart modules that can be used in the Page Builder just like the other blocks. In order to use an OpenCart module as block you must first export it. Go to Admin > System > Design > Layouts > TB_Widgets. In the module table, add the modules you want to export. You need to enter a unique sort order for each different module. Position is of no importance. Your newly exported module should appear in ‘Module blocks’ tab of the Page Builder. Its name is formed from the OpenCart module name and the sort order you entered while you were exporting it. 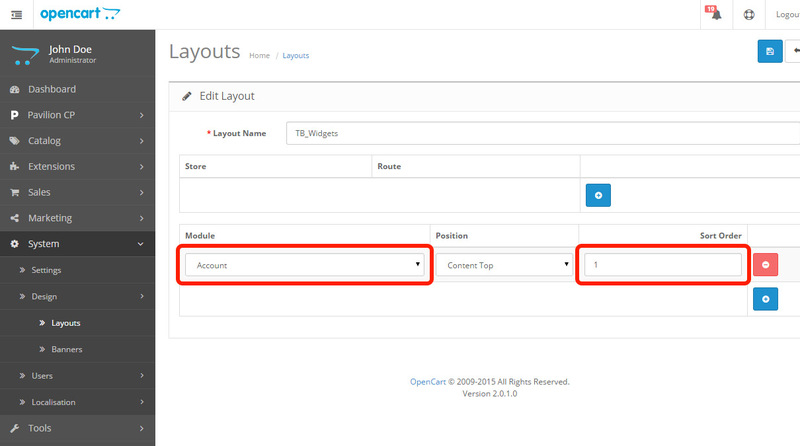 Edit the OpenCart module you want to export and change its layout to TB_Widgets. You also have to enter a sort order that is unique among the other module instances with TB_Widgets layout. Module position is of no importance. After you save the module, it will be exported to Pavilion. Do not change sort order once assigned to a Page Builder row! If you change the sort order of an assigned module block, it will disappear from the store and will be marked with red color in Page Builder.